1. Do I need my own instrument and tsume? You are not required to buy your own instrument, because it can be really expensive! Kitai-sensei has several kotos available for practice. As for tsume, first timers need not buy. Kitai-sensei has some 2nd-hand tsume available for everyone to use. However, as the number of 2nd-hand tsume is limited and they may not fit your fingers very well, everyone who would like to join us long term is encouraged to get their very own set. Each set costs about $60 in total, and can be bought from Kitai-sensei. 2. Do I need to commit over a long period of time/long practice hours? As with all subjects, all of us at KotoKotton hope that interested parties can commit to the practice hours, and come for class weekly. Frequent practice helps one to constantly revise the music scores and playing techniques, as well as to help each member of the ensemble get used to one another and learn how to play in a group together. If different members take turns to be absent, it will be very difficult to play as an ensemble. Very cliche, but it’s true that practice makes perfect. If you have trouble arranging your timetable, let any of us know and we’ll work something out. 3. Are there many performances? Do I have to perform? The ensemble has several adhoc performances throughout the year, with a couple of recurring ones like the NUS Japanese Cultural Night. We hope that as many members as possible will be able to perform, as this is a good form of motivation, and helps one to understand his/her own current playing standard. Also, this provides exposure to different performance types, venues and audiences. 4. Are there practices during exams/holidays? Exams no, holidays yes. The practices will stop a week before the exams start, so no worries. Holiday practices usually start the week after the exams end. All holiday practice dates/times will be confirmed via email, as sometimes the venue and day of the week differ from the semester practices. During the holidays, members can also come back on non-practice days for self-practice. Please let Kitai-sensei know in advance. 5. Do I get CCA points out of this? This is quite dependent on individual events that we perform for. We can’t guarantee that you’ll get points, but we hope that you’ll be interested in our ensemble for more than the points! 6. I don’t have any music background! Will it be hard to pick up? While having either learnt classical music/been in a music-related performance group before certainly helps, don’t worry about not having any music background. All related theory and musical terms will be covered when you join. 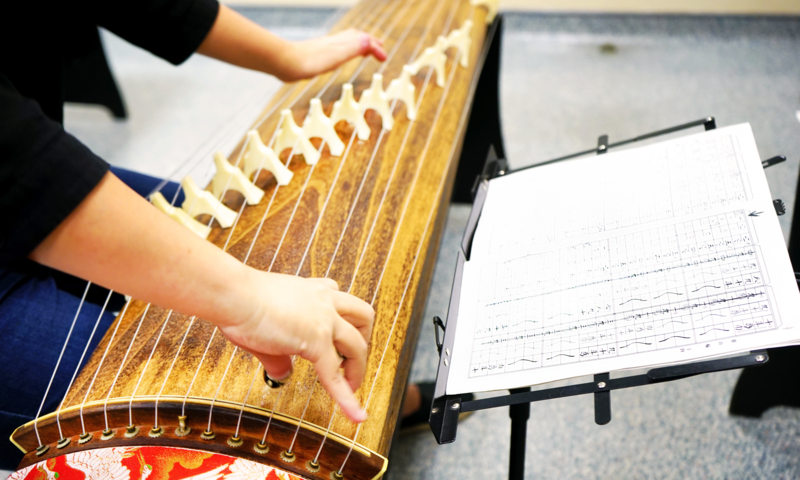 There are also terms and symbols that only koto players would understand, so everyone will start off on the same ground with regard to that. 7. I am not a NUS student. Am I allowed to join? Yes! We welcome members of the public and non-NUS students as well. Do fill in the form on this page or email us and we’ll get back to you! Look out for our practice dates if you’d like to ask us something in person!